Diwali is a festival where people tend to overspend or do most of their major shopping because at this time of the year all the exorbitantly priced things are sold at discounted rates. 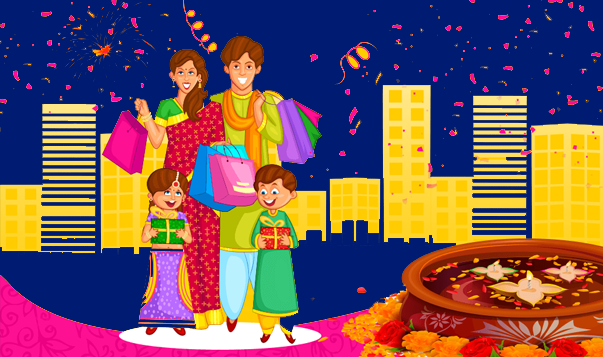 However, before you spend your hard-earned money mindlessly, consider preparing a Diwali shopping list. Every item, that you’re likely to buy for Diwali should be included in your list. Once the list is ready, scrape out the things that you can skip buying and make do with your existing things. Identify the items that you really require in that month and eliminate the ones that seem unimportant. A well-prepared shopping list will help you save money from the bonus and prevent you from being an impulsive shopper. Double-digit interest on a loan can be harsh on your financial stability, especially if you have been trying to clear it for a long time. You should use your bonus at this time to repay any high-interest debts before shopping for frills. Financial experts say that an individual’s priority must be to do away with the debt that has an interest rate more significant than what you could earn on that money elsewhere. Paying off debt can ensure peace of mind and help you clear your finances for other expenses. It’s a good idea to have an emergency fund that can meet 3-6 months of living expenses. This can ensure a stress-free lifestyle if you were to face an unexpected and costly medical issue, or unable to work for any reason. An emergency fund offers much-needed liquidity in the event of an unanticipated expense. With an emergency fund at hand, you may not have to apply for a high-interest loan to handle a crisis. On Diwali, people welcome wealth and prosperity into their homes. Therefore, buying gold and other expensive items such as a new house or a car during this festive season is considered to be auspicious. If you’re planning to buy a car or a house, this is the great season to do so as a lot of banks offer great deals on various types of loans such as car loans and home loans. Invest your bonus money in a planned way to get the most out of it. Mindless decisions that affect your credit score and reports should be avoided instead you should always take decisions that will improve your credit score further. Random purchases or loans that are difficult to repay later would refrain you from achieving stability in your finances. Make sure you plan and chalk out the ‘can’ and ‘cannot’ to stay informed and aware. Keep a check on your credit purchases. When you purchase on credit it is essential to constantly calculate and set all due dates as a reminder. It is essential to keep your credit card purchases under control as exceeding limits could affect your credit score and credit report directly. Also, to maintain a healthy credit score one must repay the credit card dues on time because any delay would hamper it. Diwali bonus and the festive discounts will make every deal look very alluring but refrain yourself from buying unnecessary things and pre-plan your expenses during the festivities. Be a smart consumer and get the maximum benefits from the dealers.